Soooo.. 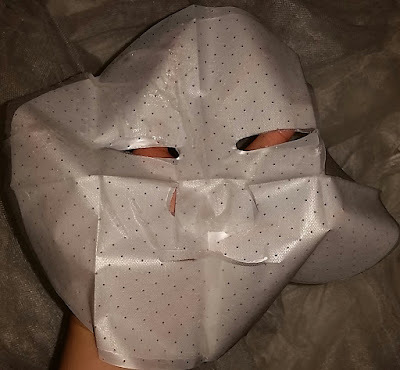 I saw lots of peeps posting selfies of themselves with Lovemore's silk masks on /r/AsianBeauty and I just couldn't resist. I did a big haul from BGO and has heard it is so popular on there that they only allow one box of each kind per order now. If you are in any Canadian cities that has a T&T, you can also find Lovemore masks there! Though there is quite a mark up there. 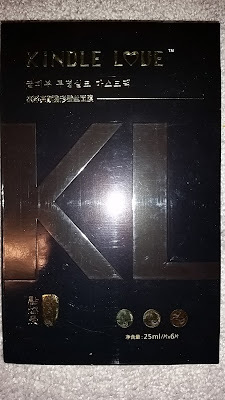 I guess the company is trying to be proactive about counterfeiters so they have placed a hologram sticker on the boxes to let consumers know which ones are the real Lovemore masks. Of course, that is only on the box not the individual masks. So I decided to try this during one of the hottest days of summer. I had walked my dog in the sun without a hat so my skin felt like it needs something to help cool down. Well it doesn't have alcohol so that's good, And it has H-acid!! Yay! 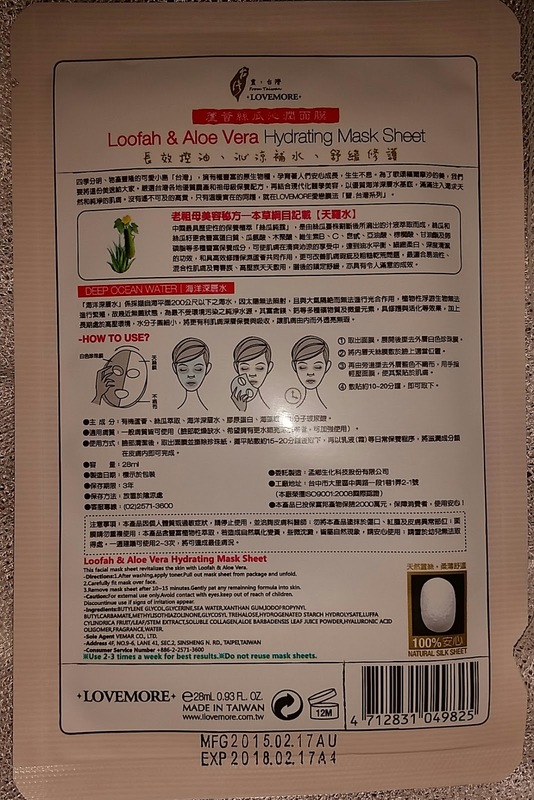 But sooo many ingredients I haven't seen in masks before. And the English ingredients were soooo tiny.. Ridiculously tiny, like you need a magnifying glass to read them without squinting. So because this is a silk mask it is more delicate and skin hugging than other masks. 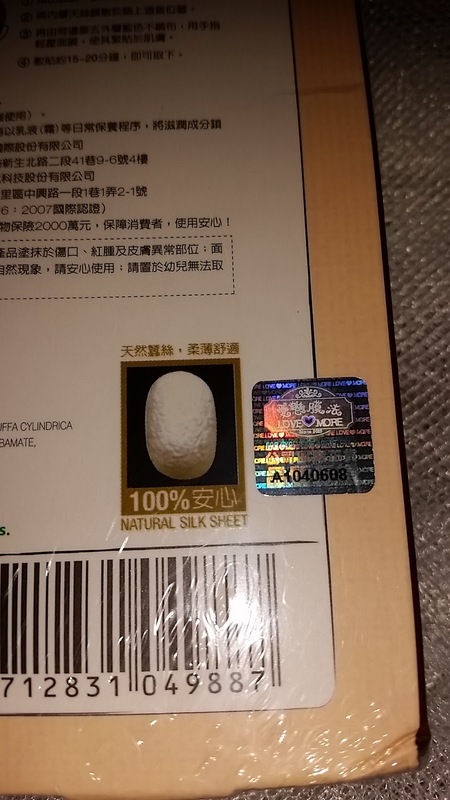 The manufacturer decided to put two different "pearl paper" on it so you know which side to put on. According to the instructions, you are suppose to remove the stiff white pearl paper first. 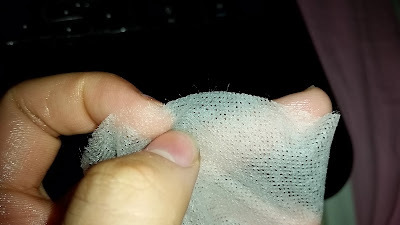 Once you take off the white pearl paper, you put on the freshly exposed side onto your face while using the blue pearl paper (it doesn't really have that stiffness or shine of a pearl paper but it serves the same purpose so I will be calling it pearl paper) as a guide. 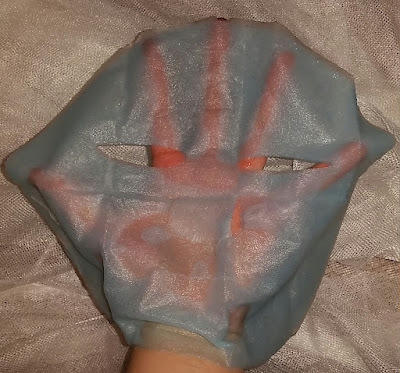 Yup, they put on a blue pearl paper so you can see where the mask is sitting on your face. It's very considerate but I gotta say, it doesn't work every time. For me it worked well the first time. Then the second time I had no such luck. 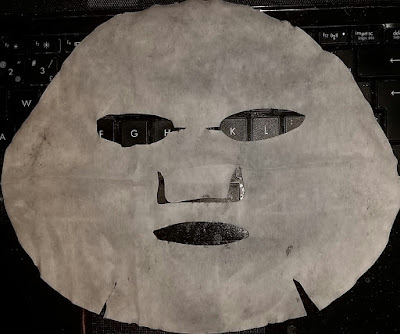 The mask shifted from the blue pearl paper so when I put it on my face it was not sitting properly. 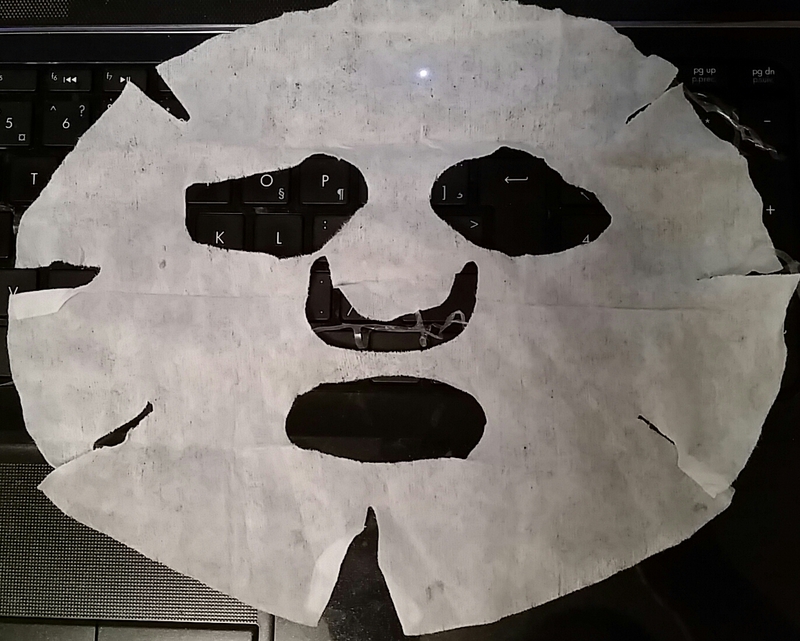 So I ended up ripping off the blue pearl paper and put on the mask using the mirror. This mask was DRIPPING in essence, but I found that this is a common theme among Taiwanese masks. I had to keep one hand below the mask as I am taking it out so it wouldn't drip onto the ground. The essence has a very light smell, like loofah and cucumber. Though it is light, it doesn't go away. I could still smell it as I had the mask on. They weren't kidding about how it hugs your skin! It was so close I can't even tell I have a mask on up close. Only complaint is that there was a little bit of extra flap around the top of my head and around the chin. The instruction said to only have it on for 10-20 minutes due to how thin it is. I actually left it on for 30 minutes because I want it on there for as long as I can. But after 30 minutes the side of my face facing the fan was dry while the other side is starting to dry out. Which I now think is kind of dumb since the mask probably started reverse osmosis on my skin. 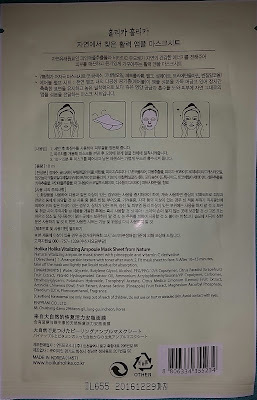 So yes, for this mask, please do follow their instructions. Or use a mask cover so the essence doesn't evaporate as quickly. The results was pretty good. My face felt supple and it looked brighter. Any redness from the sun exposure all went away! Best of all, I don't have those annoying fold lines on my face that I sometimes get from the masks itself. Um... Why is Glycerin in there twice?? As the third and last ingredients?? 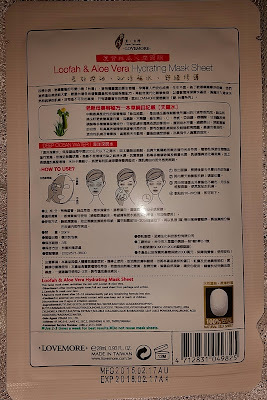 I love how under English instructions, they have to put in bright green letters "Do not reuse mask sheets". 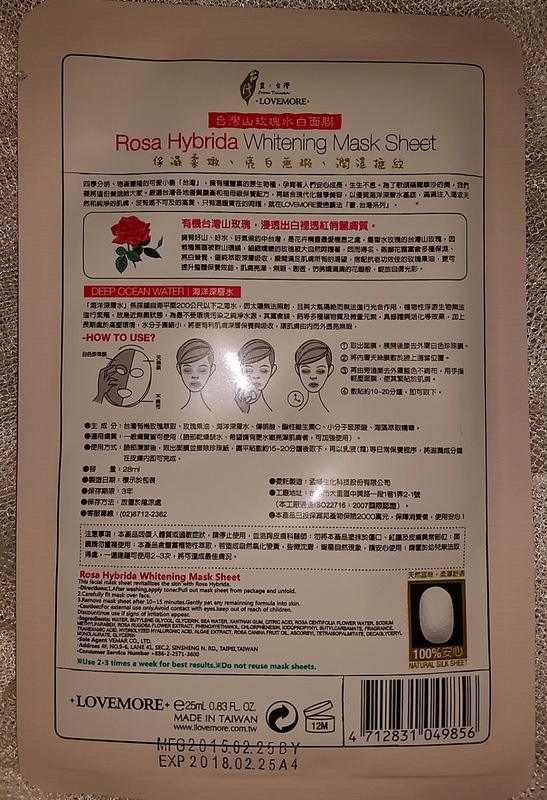 That just reminds me of a recent thread on r/AsianBeauty where people reported others who would reuse the mask sheets to be thrifty. Honestly, that is a BAD idea. I love to be thrifty but when the mask is exposed to the air it will pick up pollutants and germs in the air. Just because you put it in a baggy and in the fridge doesn't mean those germs aren't there. By putting it on your face again just means putting more germs on your face and increase the likelihood of breaking out. If you really don't want to waste the excess essence, just rub it on the rest of your body once you took off the mask. The rest of your body can do with a little TLC too. 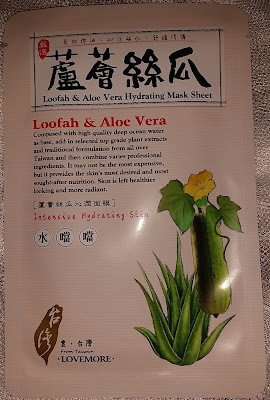 Anyways, I didn't take much pictures for this since it's same as above (loofah & aloe vera). The mask has a very light rose smell followed by a smell that I can only describe as tea. This is where I had trouble with putting on the mask. The mask pulled away and shifted between the pearl papers so nothing is aligned. I just put it on using my mirror. Still works. For this one I learned my lesson and took it off after 15 minutes because my cheeks were starting to feel dry to the touch. Don't want that reverse osmosis! As for results, honestly I didn't see much difference. The only thing I noticed was that my cheeks are less flushed than before but honestly that could be done with any masks. The disappointment with this mask actually made me kind of sad. That I spent all those money getting all these masks and they barely had enough results to warrant its cost. It's about $1.60CAD /mask from BGO if you buy enough for free shipping, or about $2.80/mask from T&T. But I made that decision to buy it all without trying them first so I won't pout too much. Will continue to try all the ones I got but probably won't repurchase them again, unless I find one that has great results of course! So this was given to me by Mogie because her aunt brought back boxes from Hong Kong and said these are expensive and are really nice. 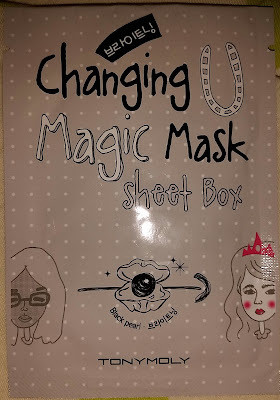 Since she knows I love to mask she gave me a box. XD Yay! Oh god. I put on something that has horse fat in it.. NOO I didn't know that when I put it on.. Frick.. I have no problem with putting on horse fat when it comes from reputable brands.. But when it's a brand I can barely find any information on, I am nervous. So the mask is protected by a single sheet of pearl paper. 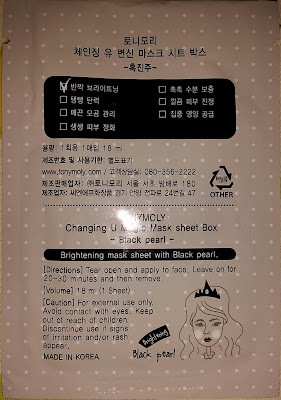 Supposedly you are to put on the mask + pearl paper on your face and adjust before taking off the pearl paper. But that pearl paper is plasticky and hard to adjust. 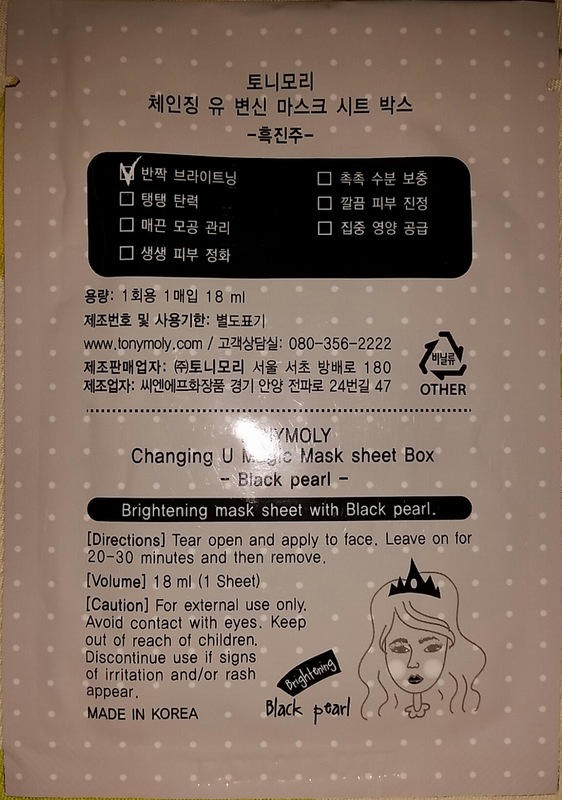 I tried the recommended method but found that I cannot see where the mask is sitting on my face and when I tried to peel off the pearl paper, the mask came along for a ride too. 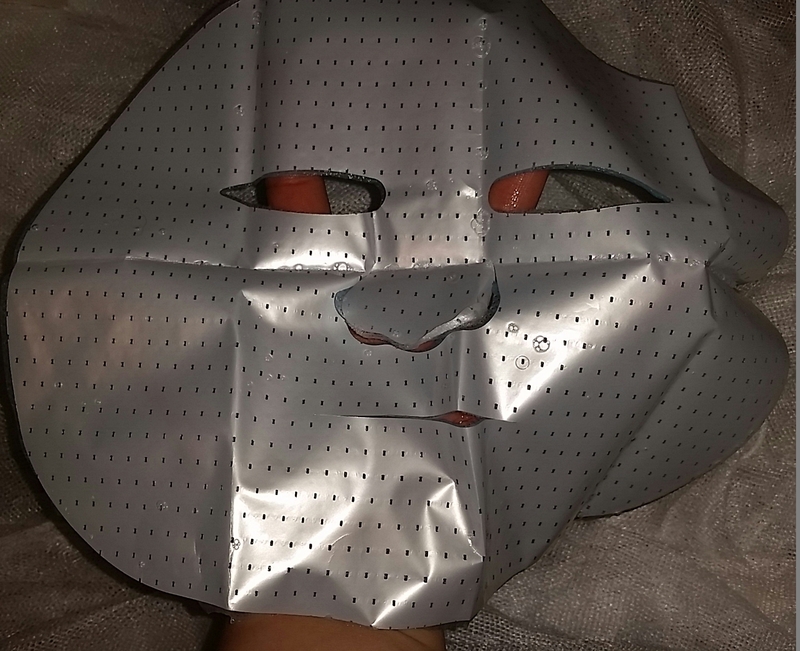 I ended up just taking it off and applying it like any normal sheet mask. The mask is sitting in a clear watery essence, smelling kind of chemical and slightly salty like salt water. I don't particularly like the smell but found it tolerable. Can you see all the little white fibres sticking up? The mask fit well with my round face. There wasn't too much extra flaps and just minor adjustments needed. However, I can see little fibres sticking up from the edges and I can pull them out with my fingers. 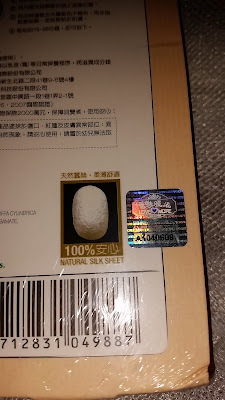 I don't know if they are the silk fibres but not too impressed with how they are put together. One disgusting fact. The mask itself turned brown after I took it off and let it air dry for a day. I took it off and just scrunched it up and tossed into the trash. The next day I see this brown crumpled ball of something and was like what the heck I don't remember throwing out brown coloured items. So I smoothed it out to see it was the mask... Ewwww why did it turn brown like that? Did it oxidize or something? None of my masks has turned that colour before. 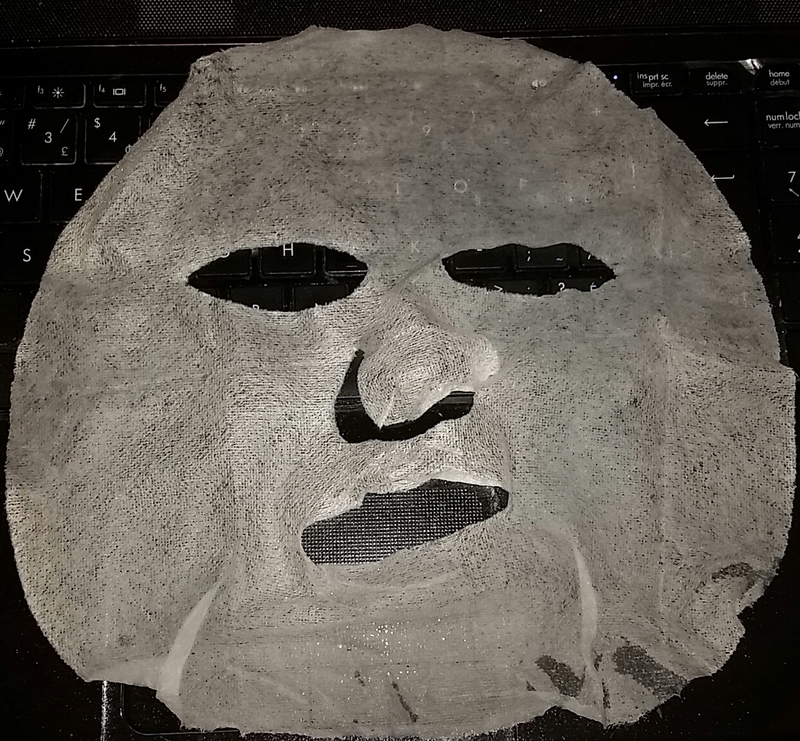 I took it off after 17 minutes and the mask was still pretty moist. But I just didn't want it on my face anymore. My face felt no more moisturized than before. Honestly it felt like I just put some water soaked mask on my face and nothing happened. I gave some to my mom and she said it did nothing to her. Mogie had extras and tried it and said she saw nothing as well. 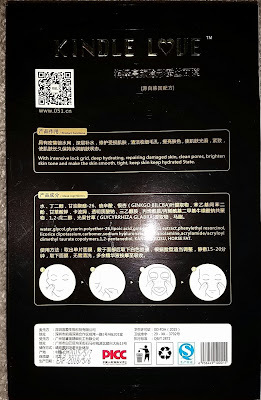 Okay, so I have been trying to use masks and then wait until I have enough for one specific benefit before doing a post. But that just takes forever since I use masks depending on what I am feeling like. It sometimes ends up being months later, I can't really remember much and my notes doesn't help. So I am just going to post them as I use them. I have been neglecting on posting about my purchases, and boy did I miss so much. Bought quite a few things over the last few months, namely MASKS!! I haven't counted my mask collection but I have a feeling it is probably close to 500. I have it sitting in two long containers and I still have another box full of masks.. Yikes..
Anyways, I am just consolidating all the recent hauls into one post to make life easier.. Oh the joy of being lazy. 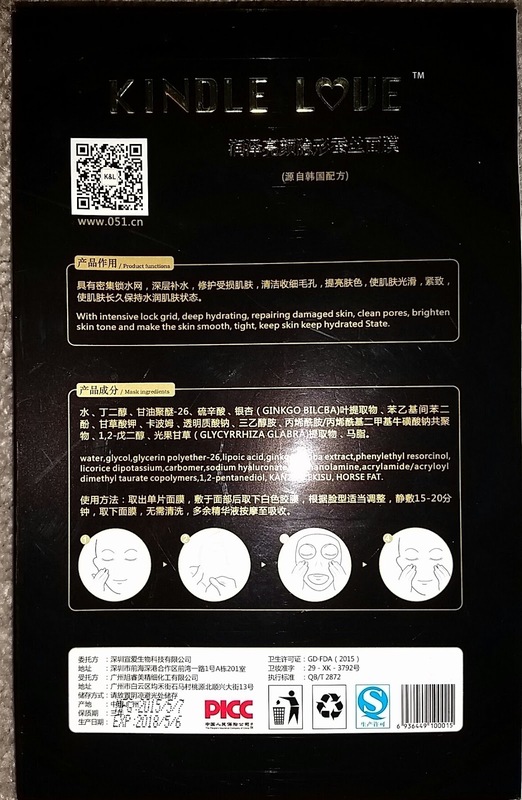 This post will be full of masks that is touted to brighten your skin. Asia uses "whitening" a lot, but they actually meant brightening. Whitening sound so scary, like your skin will whiten after usage. But these kind of products are actually supposed to help even out your skin tone and give it a "glow". Man that name is a mouthful. 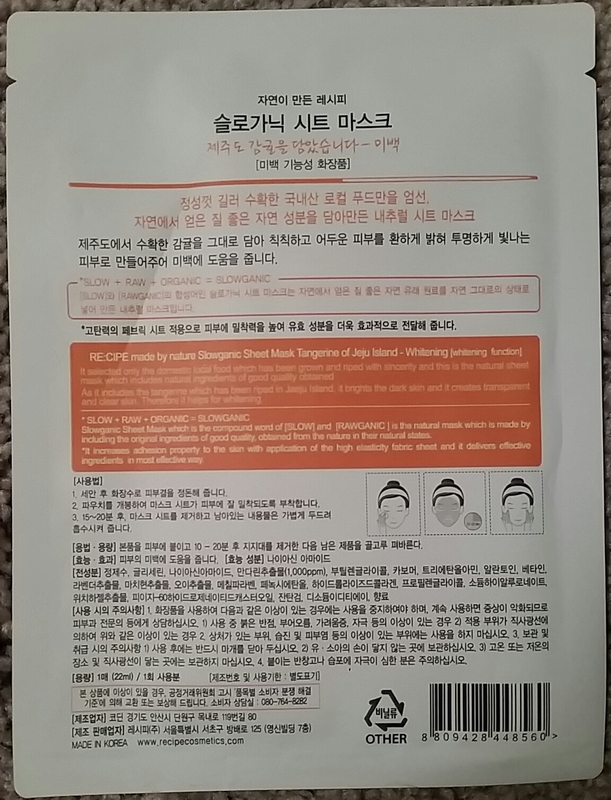 I purchased this from TesterKorea but it seems like they are no longer selling it. I purchased it for $4 per sheet. Then a few weeks later it went down to $1.50 so I was not happy I paid more than twice the cost. 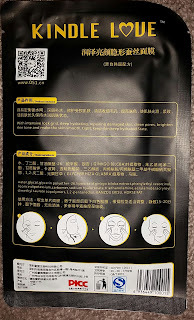 I was intrigued by the brand and thought a mask was a good way to try them out. I chose the tangerine "flavour" as it was just calling out to me. 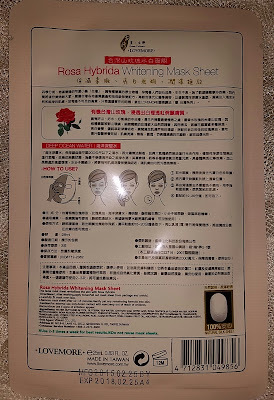 I don't really need "whitening" but I do need to even our my hyper-pigmentation. 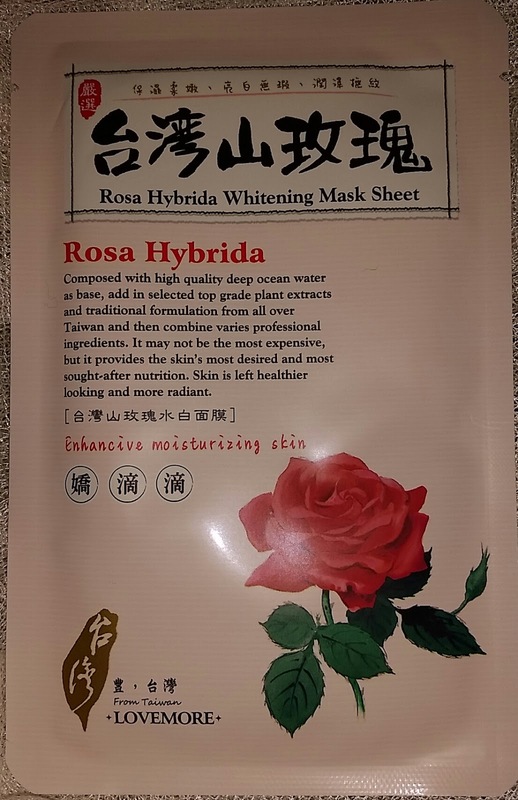 It selected only the domestic local food which has been grown and riped (ripened) with sincerity and this is the natural sheet mask which includes natural ingredients of good quality obtained. As it includes the tangerine which has been riped in Jaeju Island, it brights the dark skin and it creates transparent and clear skin. Therefore it helps for whitening. Slowganic Sheet Mask which is the compound word of [SLOW] and [RAWGANIC] is the natural mask which is made by including the original ingredients of good quality, obtained from the nature in their natural states. *It increases adhesion property to the skin with application of the high elasticity fabric sheet and it delivers effective ingredients in most effective way. 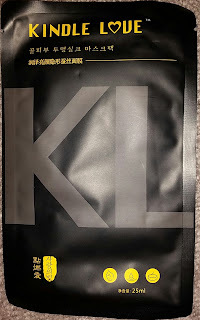 My first impression of this mask that it is heavily fragranced, I can smell it as soon as I opened it. The smell is an artificial floral orange smell, similar to my tangerine hand soap. Though I would say it leans more on the floral than the tangerine side. It was so strong that I got a headache after 5 minutes of putting on the mask. That is some strong fragrance for something made with organic ingredients. The essence is clear and thick like gel, there was just enough of it to soak the mask. The mask itself is quite thick so it took a bit of an effort to have it stretched out properly on my face. It had large eye sockets so no tiny eye sockets where half are sitting on my eye lid. *I am looking at you! Etude House's I Need You line! * There was a little bit of excess flap around my forehead but other than that, the mask fit my face pretty well. Like I mentioned, I got a headache after 5 minutes or so from the fragrance. I ended up removing the mask after 10 minutes because it was starting to feel dry to the touch, and I didn't want reverse osmosis to occur and draw moisture from my skin. Which is odd since instruction said to take it off after 15 minutes or so, so it should have enough essence to last that long. My face felt tacky after I removed it and it remained that way in the morning. 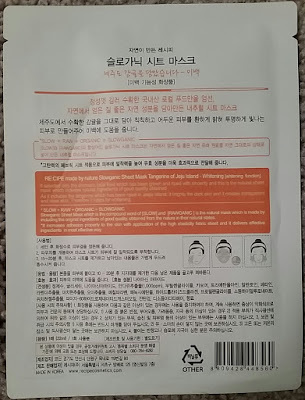 I found that my skin did look slightly brightened and evened out, but I would not pay the $4 or $1.50 for such a heavily fragranced mask that dries up in 10 minutes and have minimal effect. I got this as part of the Tonymoly Changing U box set, but TesterKorea is no longer selling it either. So I have linked it to Soko Glam, the only store I can find selling it besides Amazon. I paid $6 + shipping for the box of 7 sheet masks, but since I ordered it as part of the larger order, the shipping is slightly lower compared to if you were to order it on its own. Soko Glam offers free shipping over $50USD so I'll let you decide if their price is worth it. 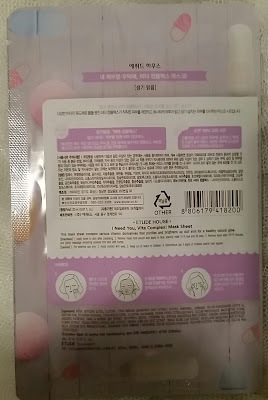 Ingredients: So there's no ingredient list listed on the back and I can't find the product on Tony Moly's website. Soko Glam has it posted on their product page under "ingredients" tab. However it seems like a generic one for the set instead of the individual ones so I can't say if the ingredients are true to this "flavour". 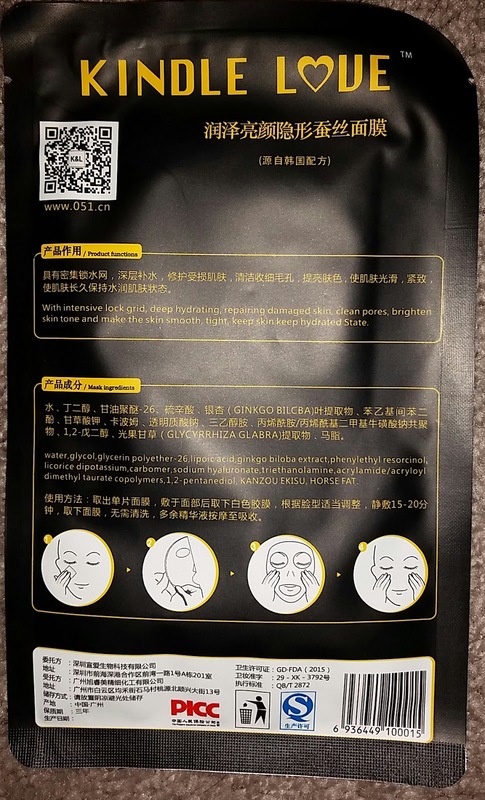 The mask is a clear watery essence that has a fake smell. It wasn't too distinct, and if I have to guess, I would say it's probably the alcohol in there. Thankfully it wasn't too strong and it went away once I put on the mask. Looks like a frowning panda face no? As for the fit, it was a bad fit. The eye holes are HUGE so quite a bit of my cheeks were not covered. The mouth hole is also very big. I managed to place the lower part sit on my chin while putting it on. There was quite a bit of the essence such that it squirted out a bit when I opened the package. That also means it was more than enough to keep the mask wet after 30 minutes. I took it off and used the excess essence on the rest of my body. The extra essence on my face absorbed in quickly. My face felt smooth and moisturized. The faint redness in my cheeks has reduced and the sun spots on my cheeks has lightened, such that I can tell a difference with photos taken with flash. 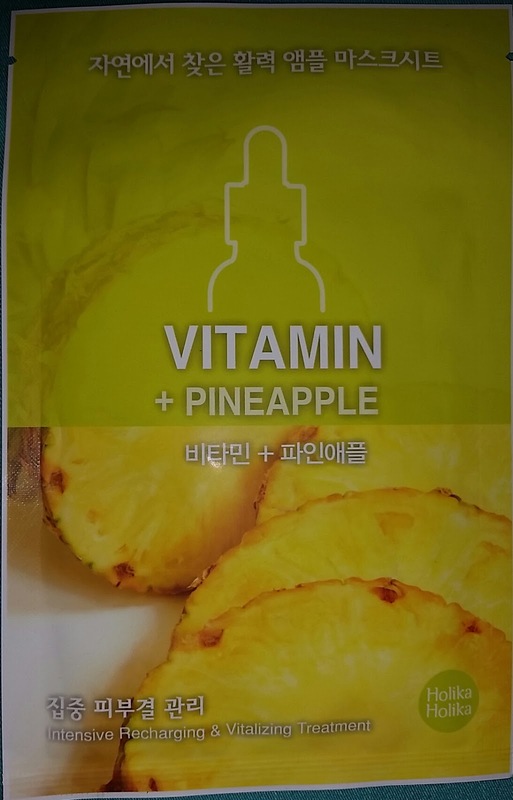 This looked interesting honestly because it made me go "pineapple?! PINEAPPLE?! Alright I'll try it". 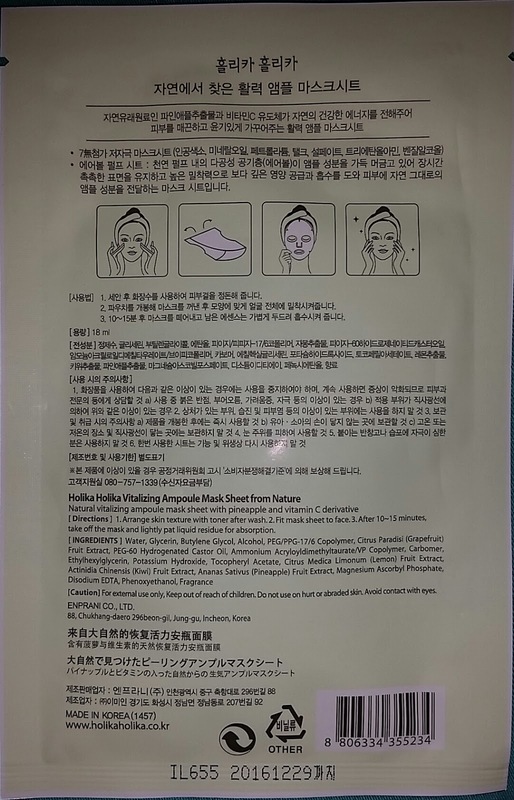 According to their website, the mask contains no artificial olourings, mineral oil, petrolatum, talc, sulfate, and benzyl alcohol. The combination is supposed to revitalize your skin, and make your skin sleek and soft. So let's see how it did. Water, Glycerin, Butylene Glycol, Alcohol, PEG/PPG-17/6 Copolymer, Citrus Paradisi (Grapefuit) Fruit Extract, PEG-60 Hydrogenated Castor Oil, Ammonium Acryloyldimethyltaurate/VP Copolymer, Carbomer, Ethylhexylglycerin, Potassium Hydroxide, Tocopheryl Acetate, Citrus Medica Limonum (Lemon) Fruit Extract, Actinidia Chinensis (Kiwi) Fruit Extract, Ananas Sativus (Pineapple) Fruit Extract, Magneisum Ascorbyl Phosphate, Disodium EDTA, Phenoxyethanol, Fragrance. 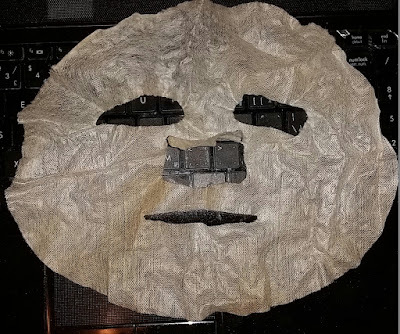 The mask was soaked in a clear essence that had a very chemical smell. I was hoping it would have that distinct pineapple smell but alas no such luck. The smell wafts into my nose every once in a while as I had it on. There was an abundance of essence left in the package, enough to cover my neck and some arm. The mask itself fit my face okay. I wish there was some slits around the temple so I can adjust it and overlay the excess parts. I also would have liked if there were more slits around the jawline so I can spread it out instead of having a bunch in one spot. The mask started to feel dry to the touch after about 15 minutes on my face so I took it off. But there was actually quite a bit of essence left on my skin, and I let that sink in before checking for results. It made my face look brighter and my pores appear to be smaller. Though it made my face feel quite tacky even after a bit of a wait. Honestly, I barely have any recollection of it. So whilst it did have good results, it is not great enough for me to go out of my way to repurchase it. This was purchased along with the rest back in late 2014 where Etude had free shipping over $30 USD and 15% off using Paypal. So of course I picked out all of the "flavours" in the I Need You line and slowly working through them. Woo! Niacinamide is in there so it should brighten your skin! Too bad it's only the 13th ingredient on the list. It's so much lower than alcohol, which is in the 4th place. First impression was this had a super strong sweet smell, not something I would associate with vitamins. It has that fake sweet smell that some erasers has, similar to the Sally's Mask in Apple. Since I have tried the line of mask before, I am not going to go too much in details. The fit is similar to the rest, it's got super tiny eye hole and a big upper lip part. It dried out faster than the others, it started to fall off in areas after 15 minutes so I ended up taking it off. The extra essence sunk in fast and does not feel sticky to the touch. Though it feels like there is a layer of something there. My skin doesn't feel softer but it feels moisturized. I don't know how to describe it any better. My skin appeared to be more even and a big raging zit on my forehead was much calmer after use. 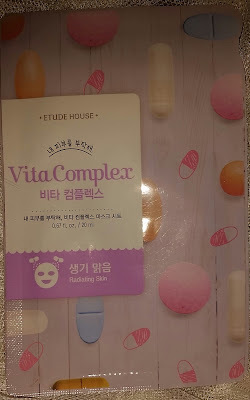 1) Etude House I Need You Mask in Vita Complex - Too Sweet of a smell but it works and it's on sale quite often at Etude. 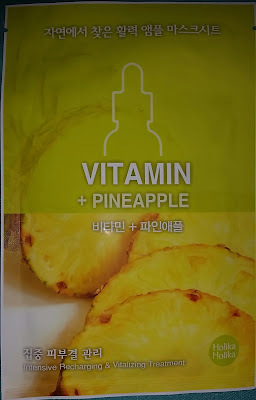 3) Holika Holika Ampoule Sheet Mask From Nature in Vitamine + Pineapple: makes my skin tacky and its chemical smell outweight the good results. 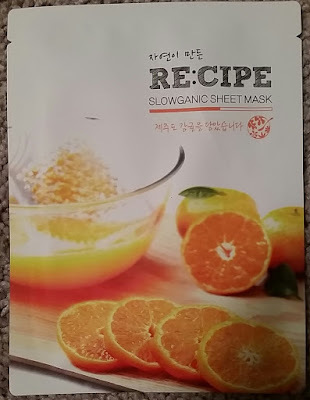 4) Re:cipe Slowganic Sheet Mask in Tangerine of Jeju Island - Minimal result, cost more than the other masks, hard to find and dries out too fast. Hola~~ I been busy for the past few weeks due to travelling and normal day to day stuff so I haven't been able to finish few of the mask posts I have lined up. I finally purged about half of my pictures from my SD card so now I gotta clean up my Dropbox folder so I can have the pictures uploaded instead of connecting my cellphone to the computer. That's partly why I haven't been blogging much. I don't connect my phone to my computer often to grab the pictures so hopefully once my Dropbox is cleared up, I can update my blog more often. Yay!! Anywhos, I started to pack for a weekend trip to Edmonton for my friend's wedding when I made a couple of discoveries. I was swatching products to decide which ones I should use for the wedding, since I don't use them often. That's when I stumbled upon quite a few make up items that I received from Memebox (back when they ship internationally) and thought I should give them to my friend who is starting out as a make up artist. So in there was a box of gel liner from Julep and I thought I would give it to her. Then as I was swatching, I remembered how it was from a mystery box and it was the last one I bought due to the fact that so much of the items were old stock. So I decided to open it up to just double check... OMG It's COVERED in mold..